﻿ Action - 18-year-old Voters? We asked Diet members what we can do when we get voting rights. We thought it is important to deepen the opinion to hear the opinion of others about what we can do. So we considered by discussion. B "What can we do during high school?" C "I think that is to know about candidates and political parties." A "It might be good to ask some questions to lawmakers." A "If we do it, we have to consider about the reason and better words not to disappoint them." C "It's a little trouble...."
D "It can be said that it will be all right if we do it." B "How can people get interested in politics?" C "It is sufficient to examine if there is something of interest in news that has flowed on television.I won't forget that we will make Japan and the world in the future. I am sure that it is true." D "It would be great to raise the news to the topic with friends, as a fun story!" A "Ah. Recently, I saw my friends are talking about politics hard. I feel it's great. I want to talk with friends like them." B "When I become 18-year-old,、I will vote. It's wasteful not to use the precious right." C "I still have a sense of duty." B "You can watch the candidate of your constituency. I felt like cheering the candidate when I saw him speech on the road without a mike." D "We would be able to do election activities when we become 18-year-old. I think we would be able to realize something if we enter a political party." A "Now that has many difficults is a chance we consider many things. I want to think much to have my opinion." D "It will be also a chance to know about their area to participate the election campaign." C "When we are 25-year-old, we can be a councilor." A "I'd love to candidacy once in life." B "With this discussion, I realized that we have many ways we can do." Discussing actually, we could deepen own ideas and spent the interesting time. We have many things what we can. We've summarized in detail below. We are sought to be interested in politics because the age given the voting right was lowered and we got to be able to get the right earlier than before. 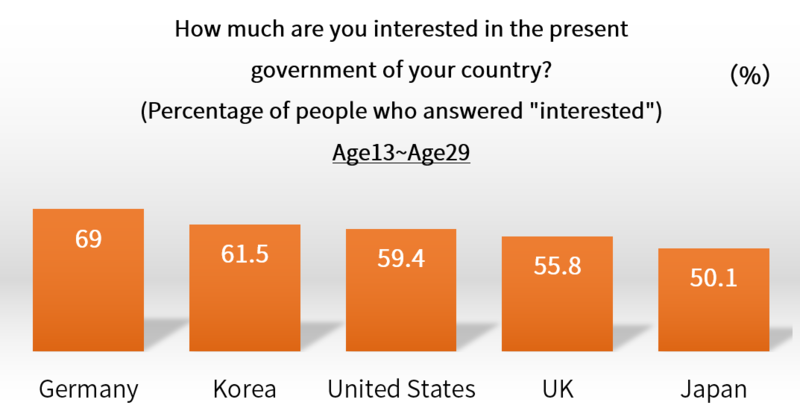 As the graph shows, interest in the politics of Japan's young people is low compared to other countries. We are given the right to decide about the future of the country or region you live with yourself. First, let's think about "Where I want to live in the future? " In carrying political participation, I think it is very important to have these ideas from when we are high school students. We received opinions of two Diet members elected from Miyagi prefecture. First, go to the election. Even without the candidate who want to put one vote, it may or may not be want no candidate was elected. There is no fact that "does not change anything in my one vote". In stacking the vote count, or winning a young rookie candidate, female lawmakers or birth, there Even be regime change. In its one vote, I expect to severe intention displayed to the politicians. ・First, I want you to learn politics in the classroom of the school. ・Every day, I want you to read the politics-related newspaper articles. ・I want you to talk about politics with the family. ・With the election age is lowered, lifting of the ban in the 18-year-old liquor and tobacco, reduction of adaptation age of the Juvenile Law, has also been studied. I want you to think in everyone yourself about becoming an adult. I've many hope or more, everyone is at the same time becomes 18 years old, it will be recognized as an adult. Now that the voting right is given, think that the right of one vote to cherish, and be a voter who can support the democracies and Japan. Voting is the most important thing in political participation. By one vote, it is important to state of own intent. At present, it has been a variety of efforts to be more easily vote. Read more information on "Election report"
If the election is close, a variety of information has been transmitted from a soapbox and posters and media. By listen to a little conscious, you should be able to deepen the knowledge of politics. It also has been actively carried out public relations activities using the Internet in recent years. To check the web site and Twitter is also one of the means of information gathering. When you want to convey your thoughts more direct, there is also the following method as examples. To be a politician is the most direct way to express own opinion. It is not yet recognized by the age limit in Japan, but in Norway there is an example that a high school student was elected a legislator. We can find that there are many what we high school students can. And, we are hoped a variety of things. First, to be interested is important to change the consciousness even a little. Then, when the voting right is given, and I think we should take advantage of it by various means.